Tree tower outside east gate. Best in the morning. 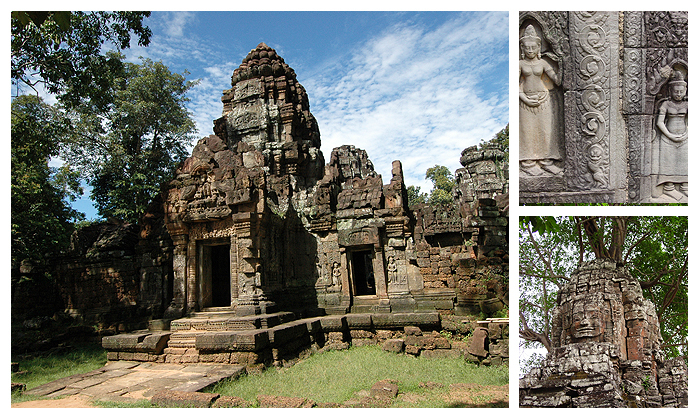 Small, classic Bayon-style monastic complex consisting of a relatively flat enclosure, face tower gopuras and cruciform interior sanctuaries much like a miniature version of Ta Prohm. 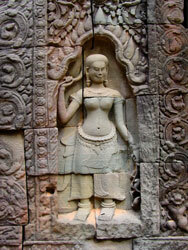 Many of the carvings are in good condition and display particularly fine execution for late 12th century works. 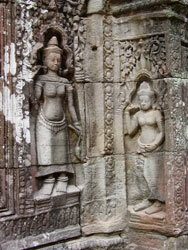 Take note of the devata carvings which show an uncommon individuality. A huge tree grows from the top of the eastern gopura. It is destroying the gate but it is a photo classic. Best photographed in the afternoon. 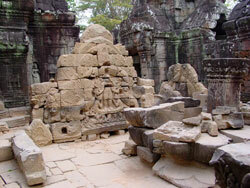 Ta Som is the most distant temple on the Grand Circuit.